Clever Lite Junior Rollator / Rolling Walker with 5 Inch Casters - Blue. 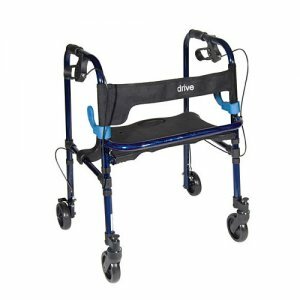 The Junior Clever Lite Rollator Walker with Wheels in blue by Drive Medical allows individuals to be seated or to use it as a traditional walker by raising the seat to step inside the frame. This rollator easily folds with a dual lever, side paddle release, and comes with a soft, flexible backrest for comfort and stability while seated. Can easily and conveniently change 5" caster wheels from "swivel" to "fixed" with a lift and turn of a pin. 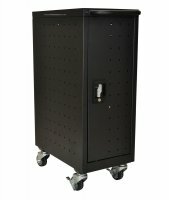 The 5" caster wheels provide a smooth transportation over most surfaces. Limited lifetime warranty; lifetime on brake cable warranty. Inside Hand Grip (Width): 18.5"; Inside Back Legs (Width): 21"; Width: 27.5"; Base Opened (Depth): 23.5"; Seat (Width): 16"; Seat (Depth): 11"; Seat (Height): 17.5"-21.25"; Handle (Height): 29.5"-33.5"
Proposition 65 Warning: This product contains a chemical known to the State of California to cause cancer, birth defects, or other repoductive harm. directly at 413-433-5399 for more favorable pricing and shipping rates. We also accept Hospital, School, and Government Purchase Order payment options through our secure checkout.